Motel 429 is conveniently located opposite Wrest Point Hotel Casino in Sandy Bay and is within minutes of Hobart city centre. Sandy Bay in Hobart is one of the most scenic and pleasant areas to stay in the city and at the Motel 429 guests can select from a range of motel rooms including deluxe queen motel rooms, standard queen rooms and standard twin rooms in this 3.5 star Hobart accommodation.. The Motel 429 is close to everything that Hobart has to offer and features numerous guests facilities including business centre, faxing facilities, free car parking, guest laundry, gym & fitness equipment, lift, sauna, spa, tour desk, bbq, baby cots available, babysitting service and daily housekeeping. Each motel room has self-controlled heating, direct dial phone, mini bar, electric blankets, complimentary tea and coffee and in-house movies. 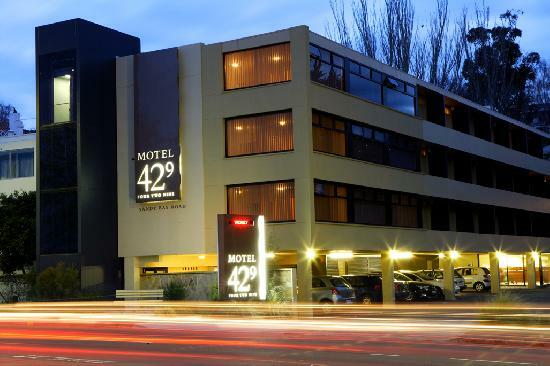 After a day discovering the delights of southern Tasmania, you can return to Motel 429 to relax and enjoy a spa, sauna and perhaps a workout in the gymnasium. We look forward to offering you a warm and hospitable welcome to Hobart. . Nearby Attractions : Motel 429 Hobart is conveniently situated just a few minutes from Hobart's CBD. Day drives down the Port Arthur and Huon regions are extremely popular and upon returning, enjoy the restaurants of Sandy Bay or Wrest Point Casino. Deluxe Queen Water Views : Sleeps up to 2 guests on 1 Queen Bed. Deluxe Self Contained : Sleeps up to 2 guests on 1 Queen Bed. Deluxe Twin : Sleeps up to 4 guests on 2 Queen Beds. Standard Queen Room : Sleeps up to 2 guests on 1 Queen Bed. Standard Twin Room : Sleeps up to 3 guests on 1 Queen & 1 Single Bed.